Hugh Fearnley-Whittingstall wants to find out why the UK wastes so much food. He challenges supermarkets to drastically reduce the amount of food they throw away. 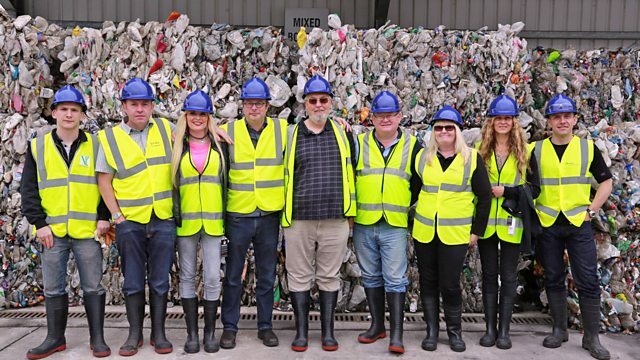 Hugh Fearnley-Whittingstall is on a mission to change the way we think about waste, by challenging supermarkets and the fast food industry to drastically reduce the amount of waste they generate. We live in a country where one third of the food we produce never gets eaten, and the average family bins £700-worth of food a year. Hugh believes something needs to be done. First he confronts ordinary shoppers in the supermarket, armed with a wheelie bin. He's going to try to take their shopping off them before they have even left the store... after all, they are only going to throw it away later in the week, so why not save them the bother of taking it home? Then he heads to a parsnip farm in Norfolk, where he uncovers the truth about the supermarkets' strict cosmetic standards, which means that any slightly imperfect fruit or veg gets rejected. In a bid to get everyone in the country to think more about how much food we bin and what we throw away, Hugh goes undercover as a bin man. Poking through people's bins, he gets to see first hand just how much stuff gets thrown away which shouldn't be. He challenges the residents to drastically reduce the amount they throw away, and offers them tips and tricks to help them save food and money. Hugh is also concerned about the amount of food waste that is being generated by the fast food industry. He works out that KFC are throwing away a million chickens a year in the UK. When he confronts them about it, they announce an ambitious plan to redistribute over half of all their leftover chicken by the end of 2016. But will they live up to their promises? BBC iWonder has an interactive guide to help you get the most out of your leftovers.